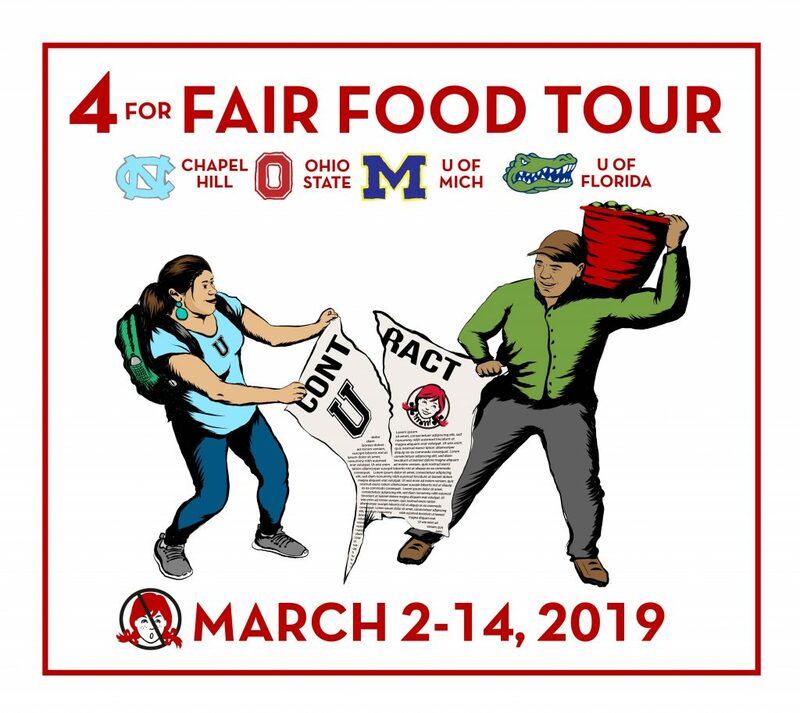 Brand-new 4 for Fair Food Tour logo, hot off the presses, featuring the four universities where farmworkers and consumer allies will take action this coming March. As students, community leaders and farmworkers lay the groundwork for the upcoming tour, calling on four leading universities to cut ties with Wendy’s, YOU can start making plans for getting in on the action! 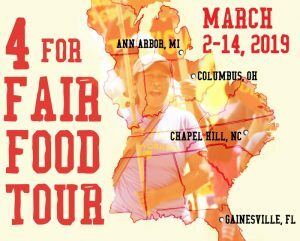 Today, we bring you a brief but exciting update on the 4 for Fair Food Tour, the four-stop major action that the CIW has planned for March 2-14 – just six weeks from now! From March 2-14, farmworkers and their families from Immokalee will travel from Florida to Michigan and back again for the national “4 for Fair Food Tour,” joining forces with students at four leading state universities who have been ramping up pressure on their administrations to boot Wendy’s off campus until the hamburger giant joins the Fair Food Program. The action will build on years of intense campus organizing at all four tour stops, bringing farmworkers themselves to the doorstep of these powerful academic institutions to demand accountability alongside students and community leaders. For the past several years, students at the University of Michigan, Ohio State University, the University of North Carolina, and the University of Floria have been organizing to send Wendy’s the same, crystal-clear message: If you want to do business on our campus, it’s not enough to just sell fast-food, it has to be Fair Food, too. In other words, instead of Wendy’s famous “4 for $4 deal,” students at all four schools are saying, with one voice, it is time to put Fair Food on Wendy’s menu, or get Wendy’s off our campus! What’s the route of the tour? If you are in any of the tour states – North Carolina, Michigan, Ohio and Florida – start making plans to go to your state’s action. If you are in the South, make your way to Gainesville for the action on the 14th. If you are anywhere else – the Northeast, Midwest, the West Coast – make your way to Ohio State University on the 8th to celebrate International Women’s Day by taking action to end sexual violence for farmworker women! Now that you’re armed with the info you need, and you’re ready to start planning your caravan – or if you want to check to see who’s already planning to go from your area – get in touch with Tali Ginsburg with the Alliance for Fair Food at tali@sfalliance.org to get more information and support. We look forward to seeing you there! Why are farmworkers embarking on the 4 for Fair Food Tour?